Findus has tonight admitted that it has been selling packs of its popular frozen lasagne that were 100 per cent horsemeat. The news is the first time that it has been confirmed that horsemeat contamination of products sold in the UK has spread beyond beef burgers. 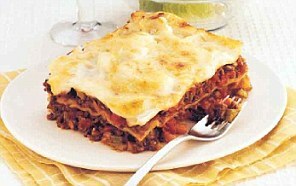 There are concerns that the horse meat used in the lasagne contained the drug bute, which is a known human health risk. Findus was today unable to say how long horsemeat has been used in its products. The lasagne packs were manufactured by French company, Comigel, at a plant in Metz, which produces food for supermarkets in Britain and Europe. Comigel makes a range of beef products for Tesco and Aldi, which have both removed them from shelves as a precautionary measure. 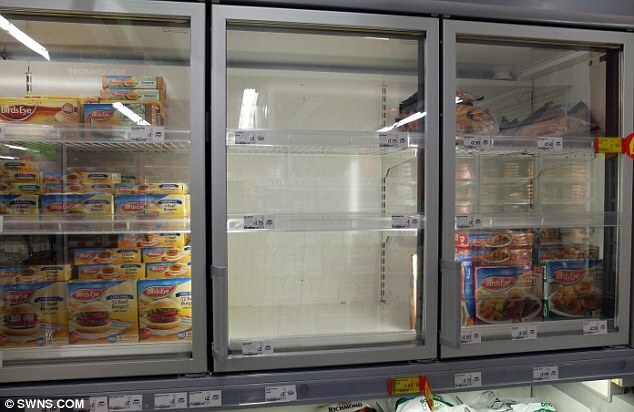 Tesco removed its packs of frozen Everyday Value Spaghetti Bolognese, whiles Aldi has withdrawn its Today’s Special Frozen Beef Lasagne and Today’s Special Frozen Spaghetti Bolognese. Tests are being carried out on these products, however there is no evidence – to date – that they contain horse meat. Findus asked supermarkets and corner shops to remove three sizes of beef lasagne – 320g, 360g and 500g – from shelves on Monday. At the time, it said this was because of what it called a ‘labelling issue’ in what appears to have been a crude attempt to pull the wool over customers’ eyes. In fact, it has now emerged that these products contained horse meat, which constitutes a crime under labelling laws and will alarm the public. The revelation raises further questions about whether major food brands have any good idea about what is being put into their products. Findus said: ‘At Findus UK we are committed to our customers and the quality of our products. 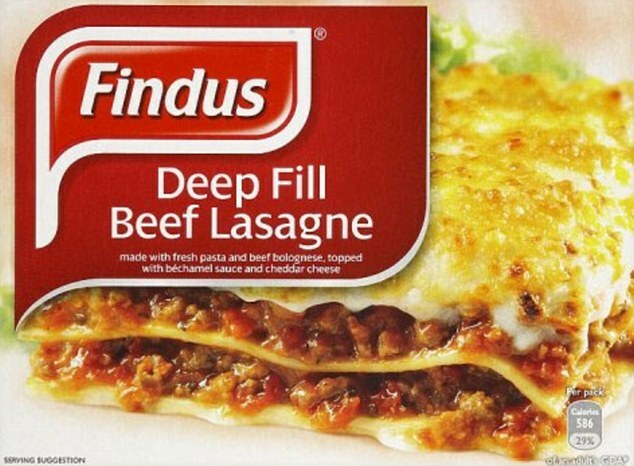 ‘Following a thorough investigation, Findus UK can confirm that testing of its beef lasagne, produced by a third party supplier and not by Findus, has revealed some product containing horse meat. ‘As a precautionary measure, on Monday we coordinated a full withdrawal of our affected beef lasagne. Environment Secretary Owen Paterson said that the firm, which was founded in Luxembourg in 1972 before moving to France in 1976, now faced an investigation for ‘illegal activity’. Mr Paterson said : ‘The responsibility for the safety and authenticity of food lies with those who produce it, and who sell or provide it to the final consumer. I know that food producers, retailers and caterers are as concerned as we are at the course of recent events. ‘The Food Standards Agency, Defra, and the Department of Health are working closely with businesses and trade bodies along the whole food chain to root out any illegal activity and enforce food safety and authenticity regulations. ‘Consumers can be confident that we will take whatever action we consider necessary if we discover evidence of criminality or negligence.’ Comigel sells a range of ‘flagship’ products including pizzas, fruit pies, and other meats like lamb, veal and pork. Until now the horsemeat scandal has centered on Irish processors, meaning Comigel is the first French food firm supplying Britain to be caught up in it. Unlike in Britain, there is no taboo against eating horse meat in France, and it remains very popular in a number of restaurants in Paris, and other parts of the country, as well as in specialist butchers. ‘We understand this it is a very sensitive subject for consumers and we would like to reassure you we have reacted immediately. We do not believe this to be a food safety issue.’ Labour’s Shadow Food and Farming Secretary, Mary Creagh, described the handling of the scandal by the Government as ‘appalling’. She said the horse meat found in the Findus products has not been tested for the presence of the drug bute, which is a known human health risk. ‘This drug is banned from the human food chain because it can cause aplastic anaemia, which is a type of leukaemia,’ she said. ‘Ministers have been hiding under their desks, rather than getting to grips with this. ‘We have a real crisis of confidence in the meat industry, people do not feel they can trust what it says on the label. This is potentially a disaster for UK supermarkets, manufacturers and farmers. ‘The government’s handling of this has been appalling. Unless they come out on the front foot and show leadership, we won’t have a meat processing industry left.’ The Food Standards Agency(FSA) said the level of horsemeat found in the Findus products ranged from 60 to 100 per cent. It said tests will be carried out for the presence of bute. A spokesman said: ‘We have no evidence to suggest that this is a food safety risk. However, the FSA has ordered Findus to test the lasagne for the veterinary drug phenylbutazone, or ‘bute’. Animals treated with phenylbutazone are not allowed to enter the food chain as it may pose a risk to human health. ‘The Findus beef lasagne was distributed to the main UK supermarkets and smaller convenience stores. Findus has already begun a full recall of these products. ‘People who have bought any Findus beef lasagne products are advised not to eat them and return them to the shop they bought them from.’ Last night the Food Standards Agency is now demanding a massive sweep of all beef products for the presence of horse meat. Bute was banned from use in humans after it was found that about one person in 30,000 recipients suffered a serious side effect. But in levels reported in previous FSA testing of contaminated meat, the maximum level found would have to be multiplied a thousand-fold to be at the same level as that which used to be given to humans. Empty shelves: Asda is just one of several supermarkets to remove products from their stores because they have been contaminated with horsemeat. This suggests that even if someone eats contaminated meat the risk of damage to their health is very low. Mail Online revealed earlier this week how a British based meat importer has been implicated in bringing in large quantities of beef from Poland that contained horse meat. Flexi Foods, which is based in Hull, describes itself and partner companies as a supplier to schools, restaurants and market stalls in the UK. The company supplied at least 60 tonnes of beef, some of which contained horse, to food processors and manufacturers in Ireland. The meat ended up at the factory of Silvercrest, County Monaghan, which is known to have made contaminated burgers for Tesco, Burger King, Asda and the Co-op among others. Posted on February 7, 2013, in Uncategorized. Bookmark the permalink. 2 Comments. They do not see it as a health issue because they “presume” that the meat was from European horses raised as meet animals. What if that horse meat is truly from Canada or Mexico, where the Paperwork is a joke, and horses at the slaughter plants are not even matched up to the fraud paperwork. These horses have been raised with wormers and steroids, and antibiotics and bute…all labeled as not approved for animals intended for human consumption.. And no one knows the last time these drugs were given to American horses that were NOT INTENDED FOR HUMAN CONSUMPTION. it is much more than a “sensitive” subject, and to cover up the problems with “we don’t believe that it is a health risk” is just further endangering the public.